BLUE HILL — Maine author and journalist Douglas Rooks will read from his new book, “Rise, Decline and Renewal: The Democratic Party in Maine” at 7 p.m. Thursday, March 29, at Blue Hill Public Library, 5 Parker Point Road. 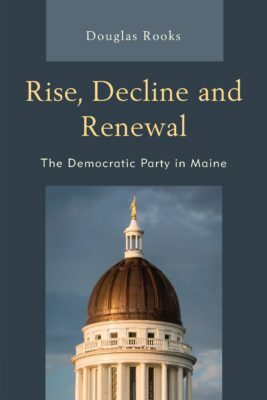 “Rise, Decline and Renewal” tells the remarkable story of the Maine Democratic Party — how it “suddenly rose from irrelevance in 1954 with the election of Governor Ed Muskie, successfully challenged the ruling Republican Party over the next two decades, and initiated a creative period of wide-ranging reforms that produced a model government for a state long perceived as a cultural and economic backwater.” The book makes the case that only a vigorous two-party system, based on competition rather than endless conflict, can restore Maine’s state government to health. Rooks is also the author of “Statesman: George Mitchell and the Art of the Possible” (Downeast Books, 2016). As a journalist, Douglas Rooks served as editorial page editor for the Kennebec Journal in Augusta, and editor and publisher of Maine Times; he has written about state government and politics for 33 years. He is former board president of the Unitarian Universalist Community Church, and currently a local columnist for the Kennebec Journal and Morning Sentinel. He lives with his wife in a 210-year-old farmhouse in West Gardiner. Signed copies of both books will be available following questions and discussion. This event is sponsored by the library, there is no charge, and everyone is welcome. For information, call the library at 374-5515.